The Viper Express shot delivers a payload of 9 lead shot with enough power and velocity to penetrate over 18 of 200 lbs compressed paper board at over 10 yards. 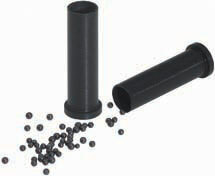 This ammunition is to be used with the Viper Express or Shadow Express airgun. Read all manufacturers warning labels."